Reading and share top 8 famous quotes and sayings about Ufc by famous authors and people. 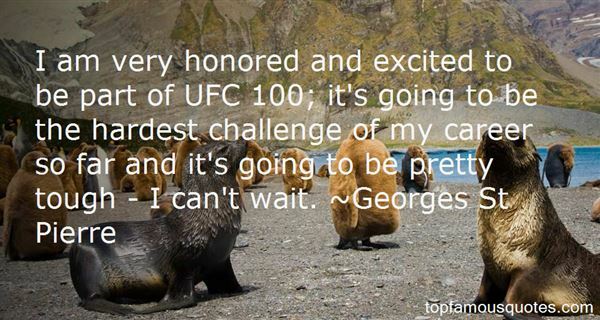 Browse top 8 famous quotes and sayings about Ufc by most favorite authors. 1. "I am very honored and excited to be part of UFC 100; it's going to be the hardest challenge of my career so far and it's going to be pretty tough - I can't wait." 2. "And second, I don't think there's much of a market for your particular brand of psychology." "So not true. ""Butch, you and I just beat the crap out of each other. ""You started it. And actually, it would be perfect for Spike TV. 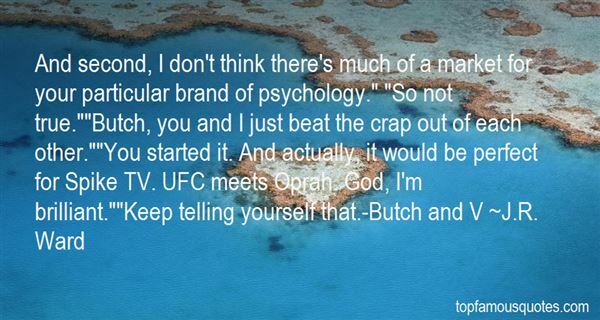 UFC meets Oprah. God, I'm brilliant. ""Keep telling yourself that.-Butch and V"
3. "I like 'em feisty. Especially with that twangy accent you got going on. I'd give my last UFC check to see you in a pair of Daisy Duke shorts. With those long legs, I bet they'd look amazing." 4. "Back in '93 I saw my first UFC fight and just became enamored by it then." 5. "I love watching 'UFC' - Ultimate Fighting Championship - I don't know why, because I'm more of a coward than a fighter, but I seem to be very drawn to these blokes actually smashing each other to bits." 6. "'Fight Master' is a proving ground for young, aspiring fighters who want a chance to play on a bigger stage. That's something it has in common with 'The Ultimate Fighter,' which has always been like a farm league for the UFC, a place to develop new talent." 7. "'Fight Master' is a show that Spike came up with. Obviously, Spike has a vested interest in Bellator, which is filling a void that was created when the UFC and 'The Ultimate Fighter' left and went to Fox. I think this fills a huge piece of the puzzle for the folks at Spike, in terms of demographics and what programming they like to do." 8. "If I could have had everything exactly the way I wanted, this is how I would have written it down. Win all my fights in the first round, then go to the UFC and headline a show, and have it as a pay-per-view and at home. People's dreams don't come true like that." I have a lot on my mind and not a lot to do so it's going to come out, all of it, and then, then, it may begin to make a sort of sense"